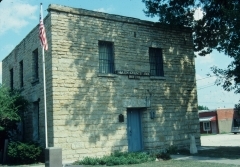 The Allen County Jail, built in 1869, occupied this two-story limestone building for 90 years. Prisoners were housed on the first floor within steel cages under laid with rock, and the jailor resided on the second floor. Located in Iola, this building is reportedly the first in the county to be erected using county funding. It was nominated for its long-time use as a correctional facility. 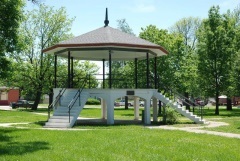 The City Square Park Bandstand is situated at the center of a public square that occupies one city block at the center of Humboldt and is surrounded by one- and two-story commercial buildings, most dating from the late 19th and early 20th centuries. The public square originated with the platting of the town in 1857, and has functioned primarily as a community gathering space. Humboldt's community band formed in 1866 under the leadership of former military bandmaster Richard Redfield, and performed in the park as early as 1867. The current bandstand was built in 1907 by John Nessell using plans developed by Charles M. Smith. It features an octagonal form, a concrete base, and a raised platform surrounded by a wrought iron railing. The bandstand was nominated for its local significance in the areas of entertainment and recreation. In 1870 Charles Lander developed his carriage and blacksmithing business in Humboldt. 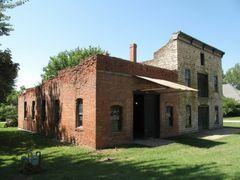 By 1876 he had constructed the two-story stone building and employed between six and ten men. Lander operated during a period of rapid community growth and changing technology. His business and the building out of which he operated evolved to fit changes in technology and to meet consumers’ needs. Soon after his son, Ed, joined the business in 1894, a brick addition was built (ca. 1910) as the woodworking shop. Ed sold the property in 1946, ending the Landers’ 70-year-old connection to the property. 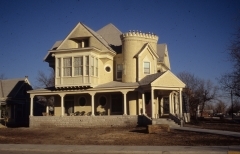 Built in Iola in 1895, the Northrup House was originally framed as a one-and-one-half story Queen Anne cottage. Like many late 19th century residences, this house was transformed into a two-and-one-half story Free Classic example of Queen Anne residential architecture. Its foundation is constructed of limestone and concrete block. The roof is hipped with lower cross gables and is clad in weatherboard and wood shingles. The building is nominated for its architectural significance as good local example of a turn-of-the-century Queen Anne-style residence.